Indigo is an herb that can grow between 1.50m (5") and 1.80m (6") high, its branches are covered with 10 to 12 light green leaves. The flowers are small and light pink or reddish. Its fruit is a cylinder shaped vine which categorizes the plant as a leguminous. Each vine grows between 5 to 7 seeds. The gender Indigofera, believed to be originally from India, but some other 140 varieties exist around the world. Some use of indigo has been recorded among Greeks and Romans. Indigo grows wild in Central America and Mexico. There are four species in El Salvador, two of those being the most cultivated. When the Spaniards came to Mexico in 1521, our people already used indigo to dye their fabrics, ceramics and was also being used as medicine. The decadence of Indigo came as a result of the invention of artificial coloring products. One of the advantages of Indigo is that it can be cultivated in different regions; from coastal areas to rocky or sandy soils among others; and it is currently being cultivated in more than half of the Salvadorian territory. The cultivation of indigo has increased since we are now back to using natural dyes for coloring. To produce the dye the following steps must be followed: the raw material is collected (leaves) and then taken to the "obraje" (manufacturer) which is generally made of 3 piles. Maceration: The leaves and branches are placed in a pile for the maceration, and then left to rest for 12 to 14 hours. The water drained out of this process will be green-blue. Oxygenation: This process begins when agitating the water until a white foam forms and then disappears. The water is left to rest until the next day. Unloading: Indigo is collected by sedimentation, when the pile is emptied, indigo forms sediment at the bottom and by using sponges this sediment is then transferred into deposits. Filtering: At this stage indigo is in a semi liquid state and it is filtered using a cloth. This process may last up to a whole day and by end of it, a dark blue paste will have formed. The indigo process can be observed at one of the many workshops existing in the country. 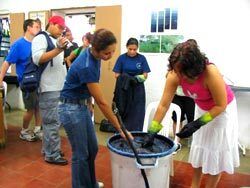 Casa Blanca in the town of Chalchuapa is not only an archaelogical site but also offers a workshop where the indigo process is used to dye cotton wear. (indigo doesn't attach well to synthetic fabrics). Here you can also purchase many products dyed with indigo. Vistors can take a quick course in dying and color their own clothes. You'll experience the transformation of colors - from green to blue, right before your eyes. After done experiencing with Indigo, a tour to the nearby archaeological site is worth taking.